Grab a mulled wine and read our top 10 Christmas events in Liverpool and Chester in 2018. 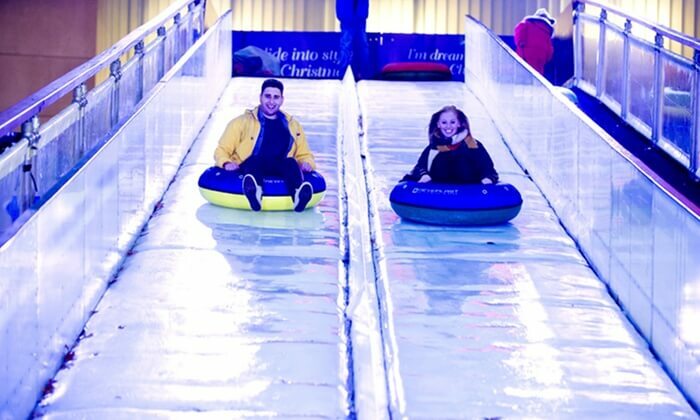 For its 3rd year, Liverpool’s iconic waterfront has been transformed into a winter wonderland. The Christmas Ice Festival features an ice rink with mini penguins for little skaters, a giant ice slide and festive fairground rides such as the Mega Mix and Ski Jump. 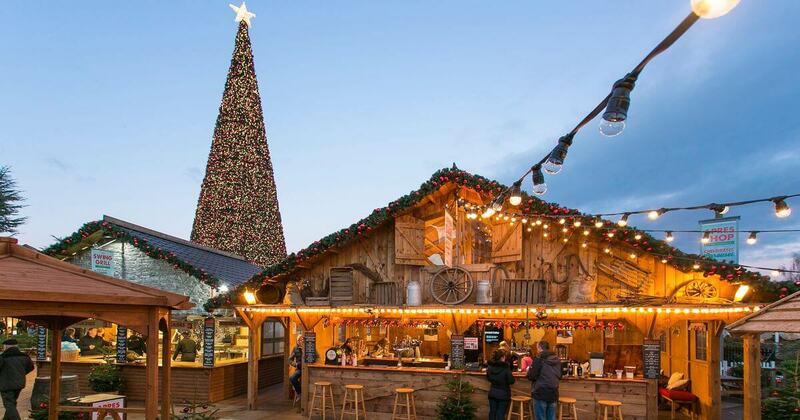 If all this sounds too daring, then take a wander through the Christmas market stalls and indulge in a winter warmer at the food and drink huts. The Ice Festival will be open until 6th January and if you’re staying with us in Liverpool, it’s just a few minutes’ walk from our Docks location! Base Top Tip: Slots fill up fast at weekends for the festive ice rink – so be sure you pre-book online. Step inside the magical Winter Garden at Croxteth Hall. 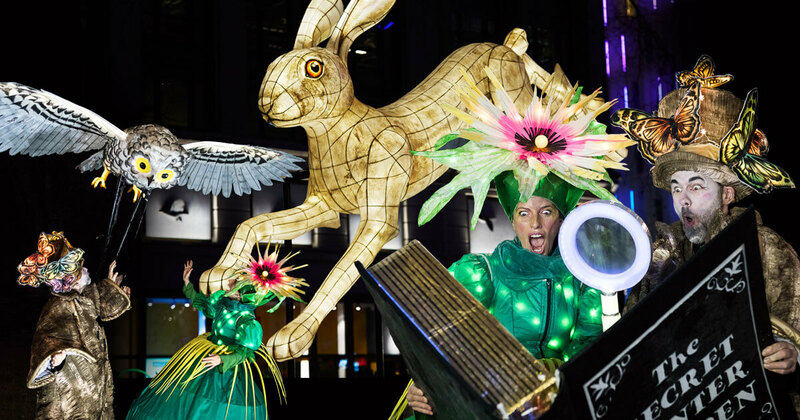 Described as an illuminated, one-of-a-kind festive lantern adventure – the event can be enjoyed by families and fun lovers of all ages. The Winter Garden is set in the beautiful surroundings of Croxteth Hall’s stunning park and walled gardens. Visitors can enjoy the illuminations as well as the market stocked with festive food and drinks. For those wanting to get crafty, you can also take part in lantern workshops and make a mini lantern or tree decoration to take home. Each night the Secret Winter Garden opens its doors from 4:30pm-9pm until 22nd December. Grab tickets and find out more here. It’s not Christmas without a visit to a Christmas Market, right? With warming hot toddies and festive grub, there’s nothing that gets you more in the Christmas spirit than wandering through the stalls at a Christmas Market. Liverpool’s Christmas Market is set on the beautiful St. George’s Plateau and features over 40 huts that span across four continents. Each stall will be selling mouth-watering food (including our fave – the Yorkshire pudding wrap), as well as dazzling arts and crafts. 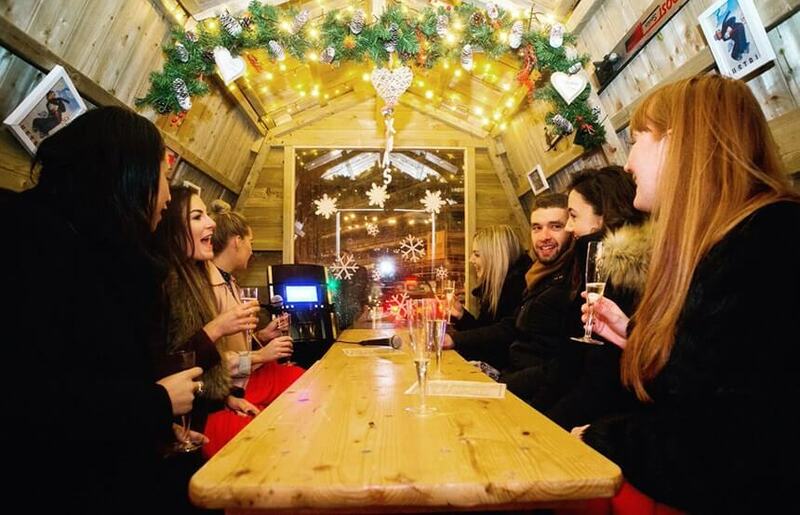 New for this year at Liverpool Christmas Markets is the Windmill Bar. They’ll be serving up traditional beers, mulled wine and other festive drinks to have you wobbling home. 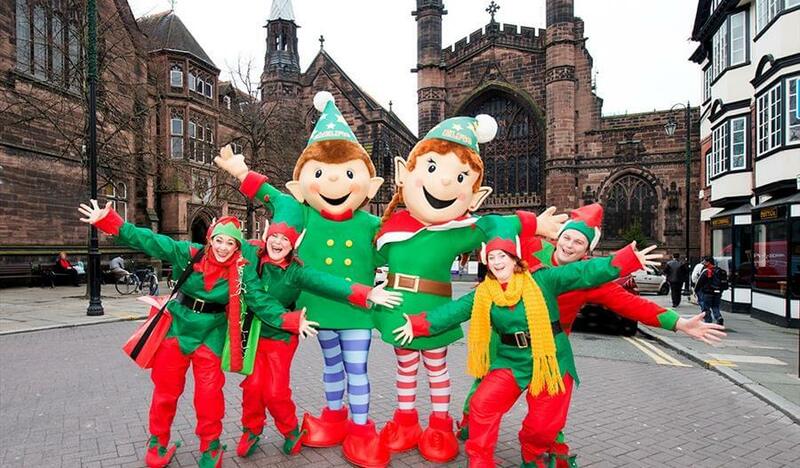 Over in Chester, shoppers are in for a magical time at Chester Christmas Market. There are over 70 traditional wooden chalets intertwined through the heart of the city and a sparkling Christmas tree in the centre. There’ll of course be an abundance of quality local and regional products, as well as clothing, accessories and loads of ideas for unique stocking fillers. Base Top Tip: Don’t miss Chester Christmas Markets Gin & Ale Bar – featuring over 40 spectacular Gins, Prosecco Cocktails and local Real Ales. This year Chester Zoo has been transformed into nine enthralling ‘worlds’, filled to the brim with animal-inspired illuminations, magical lanterns, twinkly costumed characters and Father Christmas himself! Visitors entering the zoo will be greeted by the ‘Garden of Delight’, filled with illuminated flowers and giant friendly snails, before embarking through a series of fairy-tale worlds. 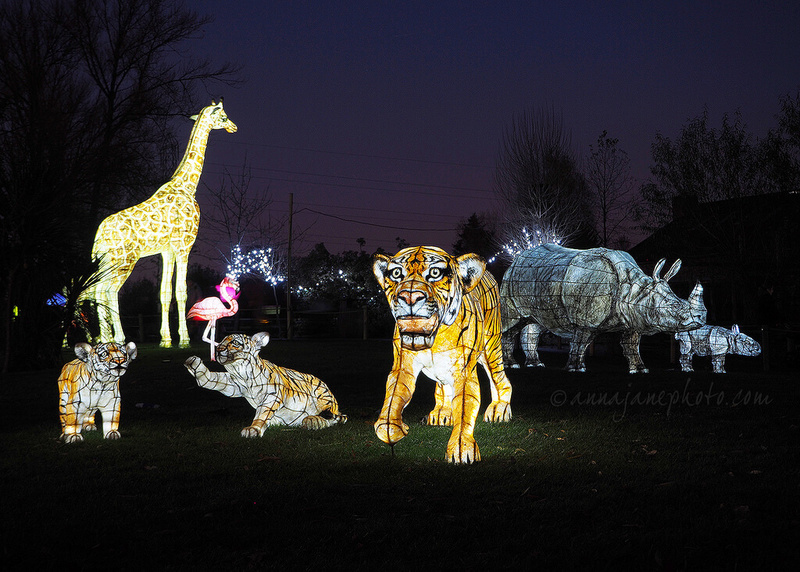 Guests of all ages will have the chance to meet glistening animal illuminations including giraffes, elephants, lions, rhinos and sun bears. The event will run on selected dates until 23rd December and you can find out more here. Base Top Tip: Make it a family break! #staywithBASE at our Chester location just a 10 minute drive from the Zoo. A brand-new light installation has been created exclusively for Liverpool this Christmas. Inspired by the city’s culture, Polaris has been created using 96 colour changing cubes, each weighing 65 kgs and containing computer-controlled LED lights. Each structure is designed to represent the famous pillars of Liverpool’s culture; the people, music. Art, Trade, education and sport. 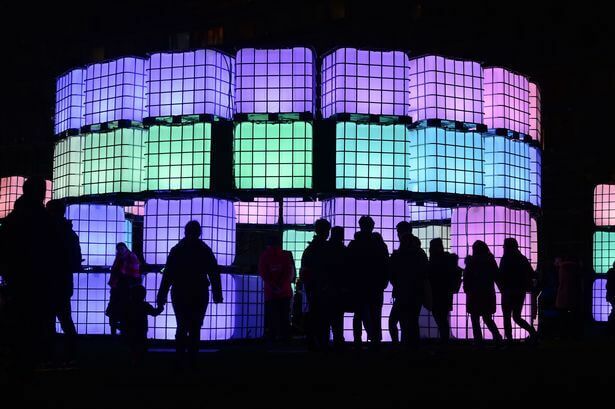 The event will run until 6th January and is located in Liverpool One’s Chavasse Park. Base Top Tip: Visit Polaris at dusk or in the evening, when the illuminations look their best. If you’re staying with Base – grab a bite to eat at The Club House (directly opposite the installation) and enjoy 20% off with our Base Benefits. Christmas shopping, whether you love it or hate it – it’s an unavoidable task. Luckily, Cheshire Oaks designer outlet is running some joyful events to keep you (and the kids) entertained while you shop. 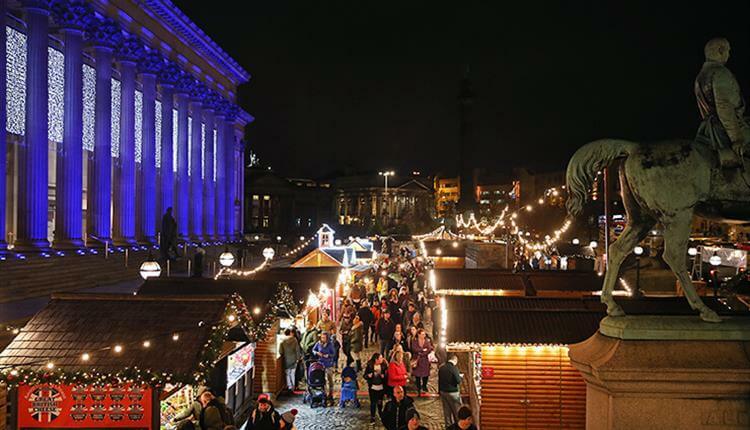 Visitors will be treated to a Festive Market, with traditional German Bratwurst and mulled wines. There’ll also be the chance to grab a bargain with Christmassy special offers at selected stores. Want to meet Santa? Every Saturday & Sunday morning, he’ll be dropping into Café Rouge for ‘Breakfast with Santa’. For only £10 adults can enjoy a delicious breakfast and kids will get to meet the big man himself – plus they can enjoy a kid’s breakfast completely free. Kids will even get a small chocolate gift from Santa. You can find out more about the Festive Events at Cheshire Oaks here. Cheshire Oaks is just a 15 minute drive from our Chester location and a 36 minute drive from our Liverpool location. 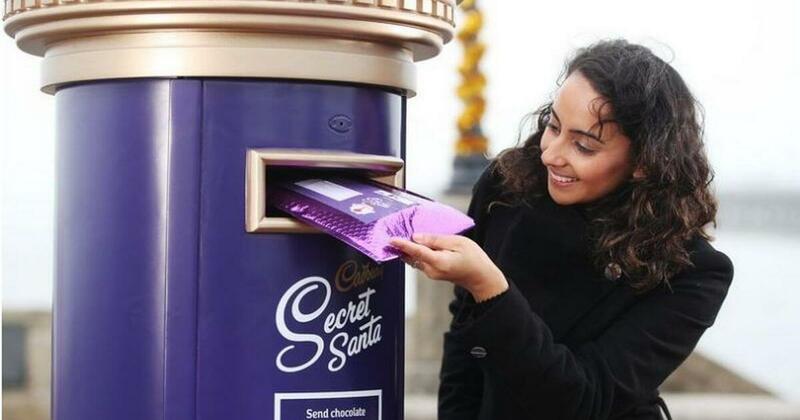 This Christmas, Cadbury is launching its very first Secret Santa Postal Service. The free facility will allow customers to send an anonymous Cadbury chocolate gift to someone special in their life. Secret Santa’s across the country can choose from Dairy Milk, Dairy Milk Whole Nut, Dairy Milk Caramel, Dairy Milk Fruit and Nut and Dairy Milk Winter Edition and they can be posted anywhere in the UK – did we mention for free? The Secret Santa postal service will arrive on Thursday 13th December from 12:30 – 6:30pm in Williamson Square in Liverpool. The chocolate bars are available on a first come, first-served basis and there is no need to book to get involved. You can find out more here. Set under the largest Christmas tree in Europe, the Alpine Après Ski bar is back for 2018! With live entertainment every day it’s the perfect place to escape the hustle and bustle and be transported straight to the Alps. Guests can hire out a private hütte, seating from 6-10 guests. Each hütte contains its very own Karaoke (or Carol – Oke) machine and guests will be waited on by a personal host. What better way to spend a winters evening than singing along to Christmas classics in style, with a festival cocktail in hand? Hütte reservations require a non-refundable booking fee of £30 which secures exclusive use of the hütte for 2 hours. You can even add a prop box to your booth to make sure you and your group get those Insta-worthy snaps. Staying with Base in Liverpool? Bar Hütte is just a 10-minute walk from our Duke Street location! Base Top Tip: Slots fill up fast at Bar Hütte so book yours quickly! Have you spotted Chelfie & Elfie? Every Saturday and Sunday throughout the Christmas season, Chesters very own elves will be out and about spreading festive cheer and giving away FREE magical glasses. The glasses, when worn will transform city lights and Christmas decorations into magical shapes – including Santa, snowmen, gift boxes, stars and trees. Kids can collect their glasses and colour them in to win great prizes as part of #Chesterkidsmas. The cheeky elves can be seen on Saturdays from 11am-4:30pm and Sundays from 11:30am-3:30pm. Find out more here. Base Top Tip: Chelfie and Elfie LOVE selfies! Grab a selfie with the elves and upload it to Instagram with the hashtag #Selfiewithanelfie to be in with the chance of winning £250 in shopping vouchers. As part of the #ChesterKidsmas festival, families are invited to embark on a magical journey through the North Pole, New York and Arandale! 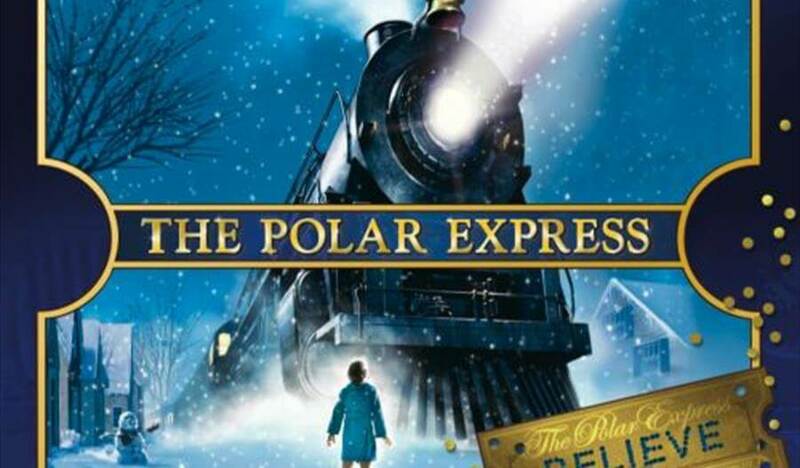 Head down to The Grosvenor Museum for FREE screenings of Frozen Sing-along, Elf and The Polar Express. Fancy dress is encouraged, so grab your popcorn and enjoy the festive fun! The films will be screened on selected dates throughout December and January. Whilst the event is free, booking is strongly advised. That’s all for this month! If you try out any of these events be sure to let us know and share your #staywithBASE on social media.